Please take the reduced bond stresses into account. 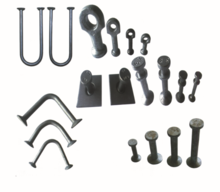 Manufactured using high strength and quaility steel. During manufacturing continual testing is conducted and each Anchor Head is marked with the safe working load.